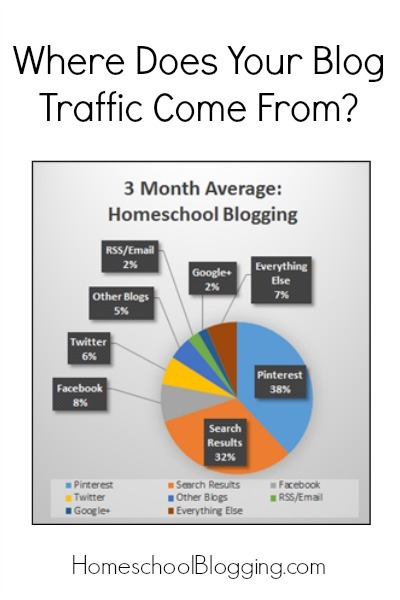 Where Does Your Blog Traffic Come From? Recently I read an article from Jon Loomer where he broke down where his blog traffic comes from, cautioning his readers not to “build a house on rented land.” The premise of the article was that relying on any one traffic source too highly could potentially put your blogging business in jeopardy. I was curious: Where does my blog traffic come from? What does this mean to me? Why do I care? Before I even finished reading the article, I could sense that I might be in trouble. I was pretty sure that the majority of my traffic was coming from a single source and should that source cease to exist, my blog would mostly likely crash and burn. So I headed to my Google Analytics and did a little research. 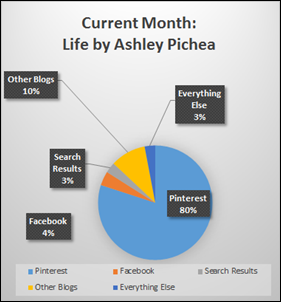 Not only did I prove my theory correct that my blog would be in trouble if Pinterest ever ceased to allow me to use it for promotional purposes, but I was able to identify where I was getting the majority of the rest of my traffic. Did you notice what’s missing? There are no Twitter or Google+ percentages listed in my results (they were each responsible for less than 1% of my traffic). Also, my RSS/Email feeds aren’t resulting in clicks over to the blog. This analysis gives me valuable information that I can use to optimize my social sharing strategies – I can either ignore these platforms altogether (not “wasting” my time), or I can “up my game” becoming more intentional in building relationships on these platforms that will increase my reach. 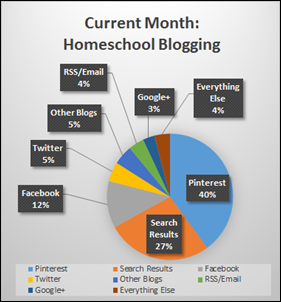 After doing the analysis on my personal blog, I decided to see what the results were for Homeschool Blogging. I was less sure of what the results would be, as I actually pay less attention to the analytics on this site in general. 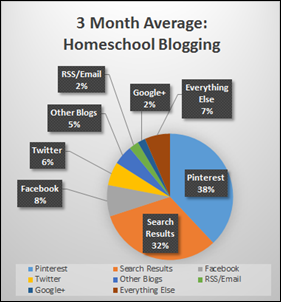 One of the insights I gained from this analysis was that thanks to the diversity of traffic sources, there is amazing potential for growth on Homeschool Blogging, but I will have to work much harder to grow my personal blog. Why do I say that? Think about it – if each traffic source increases its referrals by 10 visits each month, HSB will grow by 80 visits a month whereas my personal blog will only grow by 50 visits a month. Also, if ONE traffic source “crashes,” HSB is in a much better position to withstand the crash than my personal blog. Another insight I saw was that HSB actually has a “circular” traffic source that is growing – RSS/email. As this traffic source grows, I retain greater “control” over my audience, as I not only am getting people to “commit” to having regular contact with me, but they want to come back and interact with the content I’m sharing (and potentially even share the content with their audiences). Now it’s time to determine what traffic sources I want to be intentional about increasing, and which traffic sources I can allow to become passive (i.e. allow others to share my content without having to have an active presence myself). This will not only allow me to better manage my time, but it will give me focus for the time I am spending. And as bloggers who homeschool, we all know how limited our time is each day/week! Side Note: After Jon Loomer looked his traffic referral sources, he looked at his revenue sources. Unfortunately, I don’t have tracking set up for this yet – this is one of the things on my 2014 “to do” list. What is your biggest traffic referral source? How diversified are your traffic sources? What will you do with the information you’ve gleaned from this exercise? Cool. 😀 I did a check on my site. this month, last 3 months and a year. I get about 55% of traffic from google searches. NONE from twitter or g+. Minimal from rss. 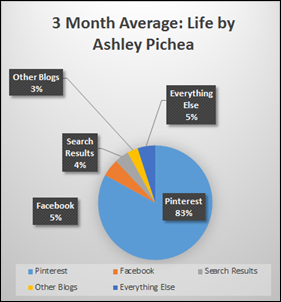 pinterest is pretty small (~3.25%). Shockingly, I get almost the same from my friend’s site which currently runs an rss feed of my site on her sidebar as I do from FB. I also get traffic from facebook mobile, which I guess you are rolling in w/ FB stats? I need to spread out more, I suppose! 🙂 Thanksf or the suggestions! It’s interesting to see where people are coming from… I check mine frequently and am always excited to see when another blogger is promoting one of my posts. It’s a great way to be able to say ‘thank you’ while the post is still ‘hot’ on their site! I’m on WordPress, so I can’t seem to find the stats on email followers, but from the look of things, I get >90% of my views from search engines. In fact, although I like working facebook and Google+ and feel it’s good long term to pin things to Pinterest, the click through rewards are minimal. If this guy is right, I need to pour even more time into these other formats, but what I have done hasn’t affected things noticeably yet, so why should I do more of the same? Is there something completely different I’m not seeing? I’ll try reading the original article and see what he suggests. Do you have Google Analytics installed or JetPack set up on your WordPress dashboard? Either of those will be able to give you fairly accurate stats on where your traffic is coming from. Some platforms take time to develop relationships with readers, and sometimes your readers just aren’t on certain platforms. The idea is to figure out where your readers ARE and then spend time there building relationships (not just sharing links). I’ve not heard of using these stat readers on WP.com, I’ll look into it. What I have started checking is the daily stats WP gives me. It looks like well over a 1/3 of my traffic does *not* come from “referrers”, which means I’ve got more people from emails and such than it looked like at first. Thanks for your help, I’ll see if those stats counters will work for me. Fascinating! I don’t think I have enough traffic on any of my sites to justify the time it would take to do this (yet) but I see how it would be very useful. I’m still curious, though, and want to do it! One thing I do know: everything needs to increase. I do use Google Analytics (which is how I know my traffic is so small!). I may start working on this the next time I look at stats (I try not to look at them every week unless there’s something specific I need to see). I just gave them a thorough look a few days ago and–tempting as making a neat pie chart is–I probably should spend my time building traffic right now. 😉 But I am definitely going to do this soon! Do you have any tips for how you gathered your information and made the pie chart? I’ve been using Google Analytics for years but I can’t say that I know my way around *really* well (and they keep changing it!). I used the “Aquistion>All Traffic” to grab the numbers and then just plugged it into an Excel spreadsheet and created the graphic there.